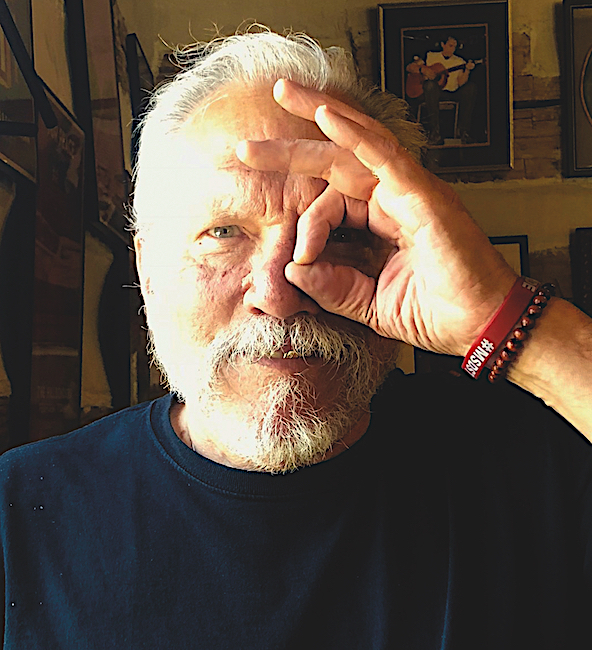 Jorma Kaukonen, photographed recently by his wife of 30 years, Vanessa, via St. Martin’s Press. Throughout the book, Kaukonen is equally honest and direct about his relationships with friends and especially family, who he says were probably “horrified” by certain aspects of the psychedelic scene in San Francisco. Ultimately, though, his parents and grandparents supported the notion that artists must express themselves, even if the artist in question was a son or grandson. Still, Kaukonen spends far more time on pointing out his failings than laying blame—Been So Long is short on settling scores, making it an outlier in the rock-star-autobiography genre. And lest you think that the book is all confessional and apologia, Kaukonen also regularly detours into the nerdy recollections of a certifiable gearhead, whether that gear is designed to produce music (guitars and amplifiers) or internal combustion (cars and motorcycles). 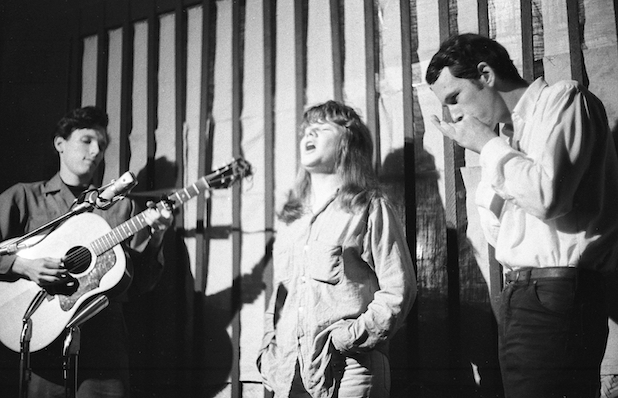 From Left to right, Jorma Kaukonen, Janis Joplin, and Steve Talbott at the Folk Theater in San Jose, California, 1962. Photo by Marjorie Alette, via St. Martin’s Press. 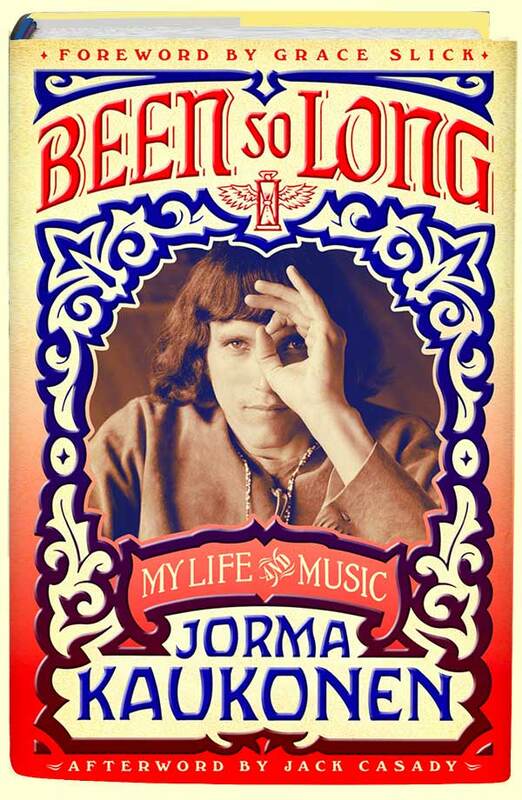 By now, some of you may be wondering, “Jorma who?” Well, even if you don’t know Jorma Kaukonen by name, you’re probably familiar with his work. That’s Kaukonen playing the vaguely flamenco-style electric-guitar solo at the beginning of “White Rabbit,” one of two Grace Slick hits on the Airplane’s second album, “Surrealistic Pillow,” that Kaukonen believes got the band into the Rock & Roll Hall of Fame. You may also be familiar with Kaukonen’s contemporaries. Along with Jerry Garcia of the Grateful Dead, John Cipollina of Quicksilver Messenger Service, Barry Melton of Country Joe and the Fish, Mike Wilhelm of the Charlatans, and James Gurley of Big Brother and the Holding Company, Kaukonen defined the San Francisco Sound of the late 1960s, infusing the wail and feedback of a psychedelic electric-guitar with rhythms and riffs borrowed from the blues. In Hot Tuna, which continues to tour to this day, Kaukonen and Jefferson Airplane bassist, Jack Casady, threw their net of musical influences even wider, sounding like a traditional Americana string band on some albums, a distortion-heavy power-rock outfit on others, with a repertoire that included everything from traditional Christian spirituals to original Kaukonen compositions. Most rock stars have unlikely origin stories, and Kaukonen is no exception. To put his journey in context, consider the case of one of his contemporaries, Janis Joplin, about whom Kaukonen writes, “The first time I met Janis, I realized that I was in the presence of greatness.” No disrespect, but it’s a safe bet Joplin was not thinking the same thing about Kaukonen when they performed together in 1962, with Steve Talbott on harmonica, at the Folk Theater in San Jose, California. Five years before her breakthrough with Big Brother and the Holding Company, Joplin was already a full-time musician at age 19, the product of a troubled childhood in the oil-refinery town of Port Arthur, Texas. A budding drug habit would round out the dues she’d eventually pay to sing the blues. A self-described “Foreign Service brat,” Kaukonen (at left, in glasses) spent chunks of his childhood growing up in places like the Philippines. 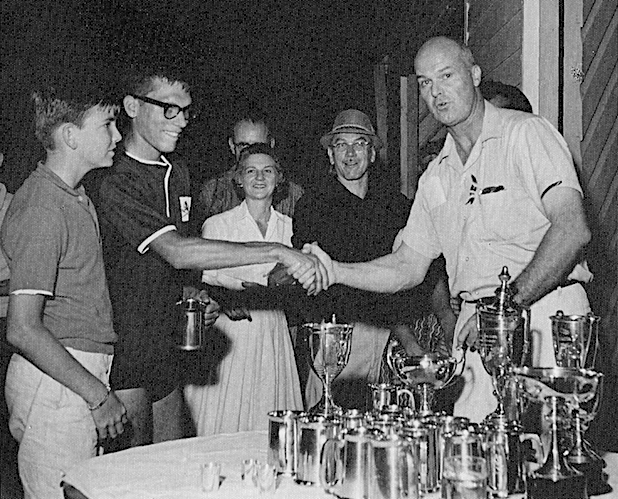 This photo from 1961 documents Kaukonen’s participation in the Christmas regatta at the Manila Boat Club. Photo via St. Martin’s Press. In contrast, in 1962, Kaukonen was an indifferent student at a small, private, Jesuit university, still learning how to fingerpick, although he, too, was developing what would become an impressive drug habit, or several. Kaukonen’s parents, Jorma Sr. and Beatrice, were only a generation removed from Finland and Russia. Kaukonen himself grew up in Washington, D.C., the son of a diplomat whose career occasionally relocated the family to places like the Philippines and Pakistan, where servants waited on their every need. Kaukonen, in short, took the small stage at the Folk Theater as a bona-fide member of the privileged class, a self-described “Foreign Service brat”—the dues he’d pay would be entirely self-inflicted. Kaukonen made his first down payment the summer after his gig with Joplin, when he joined his parents for his dad’s posting at the American Embassy in Sweden. By then, Kaukonen had met Jerry Garcia and other eventual members of the Grateful Dead, future Quicksilver Messenger Service founding member David Freiberg, and Paul Kantner, who, a few years later, would invite Kaukonen to join Jefferson Airplane. In 1963, Kaukonen, age 22, could have probably hung out and jammed with these musicians all summer long, but the pull of family was apparently still strong. Kaukonen’s first wife, Lena Margareta Pettersson, was a frustrated artist, but she did create artwork for Hot Tuna’s first two albums released in 1970 and ’71 (left and center), as well as Kaukonen’s first solo album, “Quah” (right) from 1974. As it turned out, the summer in Sweden included an excursion aboard a tourist ship from Stockholm to Helsinki and then on to Leningrad for a “roots trip” with his Jewish grandparents, Ben and Vera Levine, who had not been back to the old country since they left it for a better life in America at the turn of the 20th century. One of the passengers on that tourist ship was a 19-year-old Swede named Lena Margareta Pettersson, who shared Kaukonen’s fondness for drinking Johnnie Walker Black and playing cards. Their brief week-to-10 days together should have been a fun international fling. Then, on the last day of the tour, in Moscow’s Red Square no less, Kaukonen proposed marriage. By January of 1964, Margareta had joined Kaukonen in California. Shortly thereafter, the two were married in a 6-minute civic ceremony, which they celebrated with an evening of cheap wine, a nasty fight, and Kaukonen sleeping on the couch. That cheery episode wasn’t even the first warning sign that their relationship was not going to be a bed of roses, but Kaukonen soldiered on, driven by the inertia of an impulsive decision he was unable to bring himself to undo. In fact, the aimlessness that pervaded their intensely stormy relationship would last 20 years, only stumbling to a clumsy close in 1984, by which time Margareta was a junkie and Kaukonen had taken to drinking during the day, a prelude to his own opiate addiction. In addition to a love of music, Kaukonen has always had a passion for motorcycles. 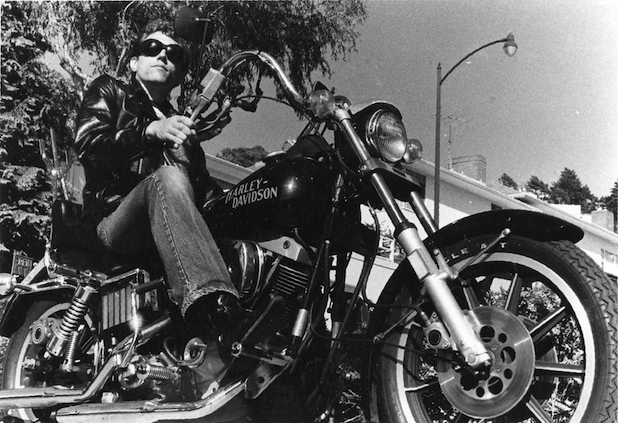 This shot of him on a favorite Harley in San Francisco was taken by Margareta Kaukonen, via St. Martin’s Press. You can read Kaukonen’s book for more sordid details about the slow-motion train wreck that was their marriage, in which each gave as good as they got in their own destructive ways. For example, before they sold their house in San Francisco as a part of their divorce, the hole Margareta had punched in the kitchen wall, with the words “THE PRICE OF PASSION” written next to it, had to be repaired (“What a sense of humor!” Kaukonen exclaims in Been So Long). Beyond such colorful specifics, though, Kaukonen’s odd passivity and aversion to confrontation is one of the book’s major themes, applying not just to his relationships with people, but to the way he viewed his career as well. Later, in 1972, when the Airplane was barely able to keep itself aloft musically or financially, Kaukonen ghosted, quitting the band without so much as a goodbye. 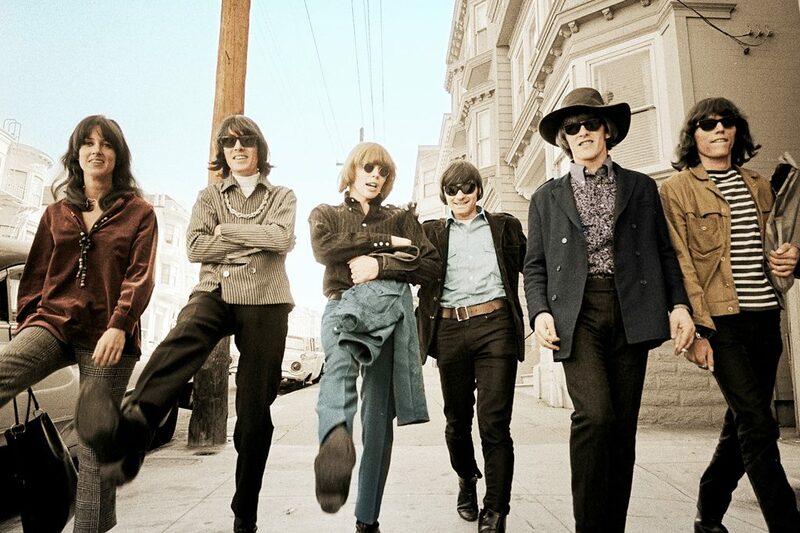 “I walked out of my life as a member of Jefferson Airplane as if it had never been,” he writes. Years later, he even pulled the same passive-aggressive stunt on Hot Tuna and his great friend Jack Casady, marveling in Been So Long that Casady was willing to forgive him, and thanking his maker that he did—the two friends continue to perform and teach together to this day. 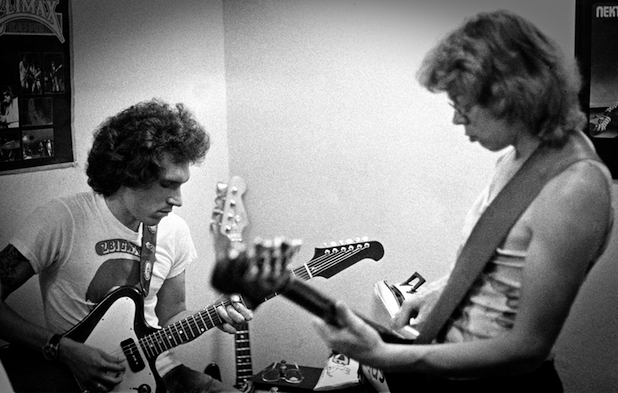 Kaukonen met Jack Casady (right) when they were still kids in Washington, D.C. They played together in Jefferson Airplane before launching their own band, Hot Tuna, which continues to perform to this day. Photo © Barry Berenson, via St. Martin’s Press. Still, it’s not like Kaukonen sleepwalked his way through life, especially in the Airplane’s early years. In the beginning, he remembers the group “rehearsing relentlessly” in an effort to be taken seriously by the critics. When the band’s early folk sound began to morph into something more electric, it was Kaukonen who recruited a childhood chum from D.C., the aforementioned Jack Casady, to become the group’s new bass player. Of course, Kaukonen does not pat himself on the back too hard for the band’s success. “You’ve got to fritter away a lot of time to get good at whatever it is that you do,” he writes with characteristic self-deprecation. “We frittered away a lot of time and got good at it.” Nor does he discount the importance of forces he could not anticipate and did not control. “We were in the right place at the right time and we made the most of our good fortune,” he concludes in Been So Long. 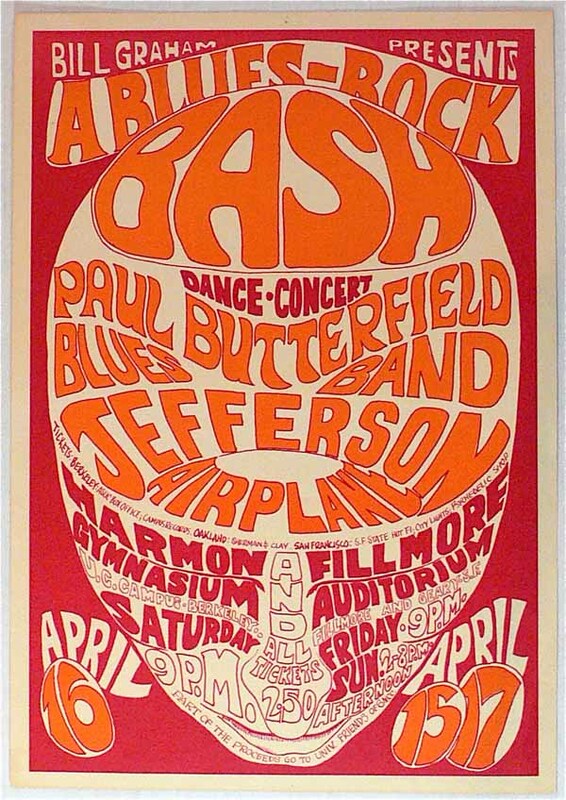 When Jefferson Airplane headlined this concert in Vancouver, B.C., in 1966, Kaukonen couldn’t believe that Muddy Waters was one of the opening acts. “It just didn’t seem right,” he writes in Been So Long. One example of that good fortune says a lot about what it was like to be on the scene in the early days, before the hype surrounding 1967’s Summer of Love ruined everything. It occurred in the fall of 1966, when the Airplane played a number of shows, including the Monterey Jazz Festival, with the Paul Butterfield Blues Band from Chicago. The Airplane had already played with “Butter and the boys,” as Kaukonen calls them in his book, that spring. For several days that fall, Butterfield’s lead guitarist, Mike Bloomfield, and his wife, Susan, stayed at Kaukonen and Margareta’s place on Divisadero Street in San Francisco. At the time, Bloomfield was arguably the most important guitarist of the day. He had played the guitar solos on Bob Dylan’s “Like a Rolling Stone” in 1965, and was earning raves for co-writing the 13-minute, instrumental title track of the Butterfield Blues Band’s “East-West” album, which had just been released. Within a year, Bloomfield’s star would be eclipsed by Jimi Hendrix, but at the time, Mike Bloomfield was the big dog of the electric guitar. 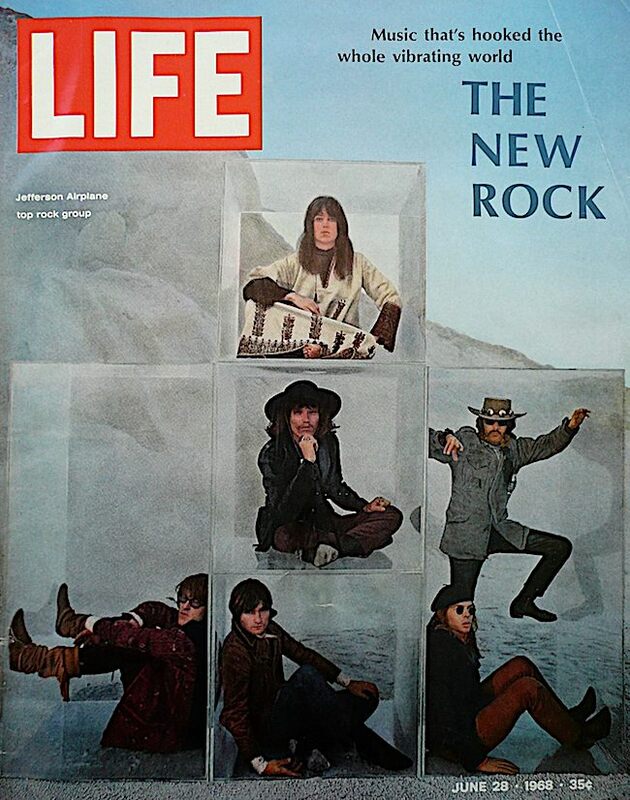 By 1968, Kaukonen’s personal life was a mess, but his musical life was flying high, as seen by this “LIFE” magazine cover. That’s Kaukonen in the center cube. 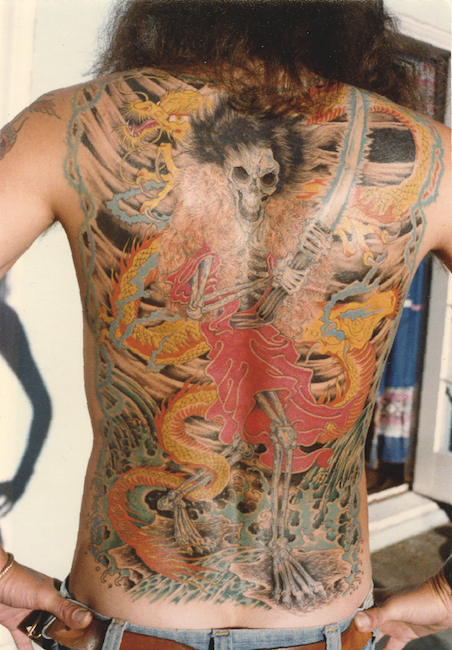 Kaukonen’s collection of tattoos includes this masterpiece on his back by Ed Hardy. Photo via St. Martin’s Press. 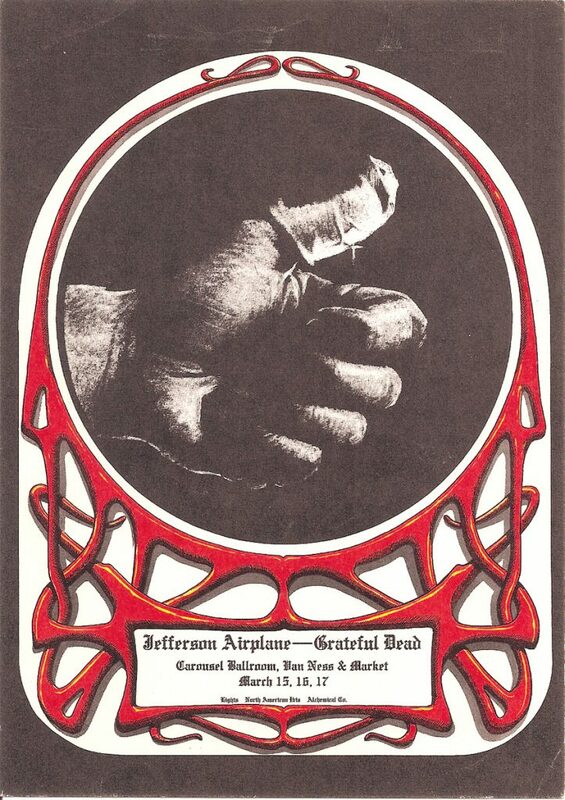 For a brief period in 1968, the Airplane and Grateful Dead ran the Carousel Ballroom in San Francisco. 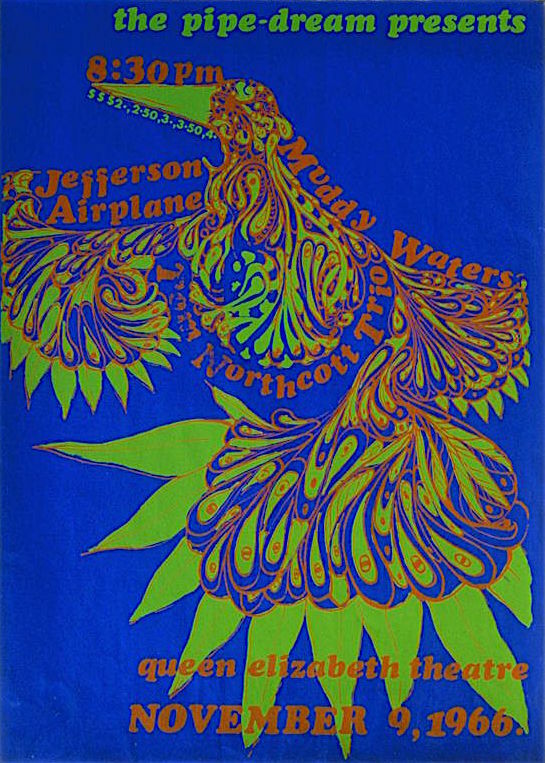 This poster by Alton Kelley is an example of how that responsibility often meant the two bands would have to perform there to make ends meet. Kaukonen’s substance abuse wreaked havoc on pretty much every aspect of his life, alienating him from the ones he loved and distancing him from his Jewish faith, which he has renewed in recent decades thanks to the encouragement of his wife of 30 years, Vanessa, who lives with Kaukonen and their daughter, Izze, at the Kaukonen family compound and music camp, Fur Peace Ranch, in southeast Ohio. 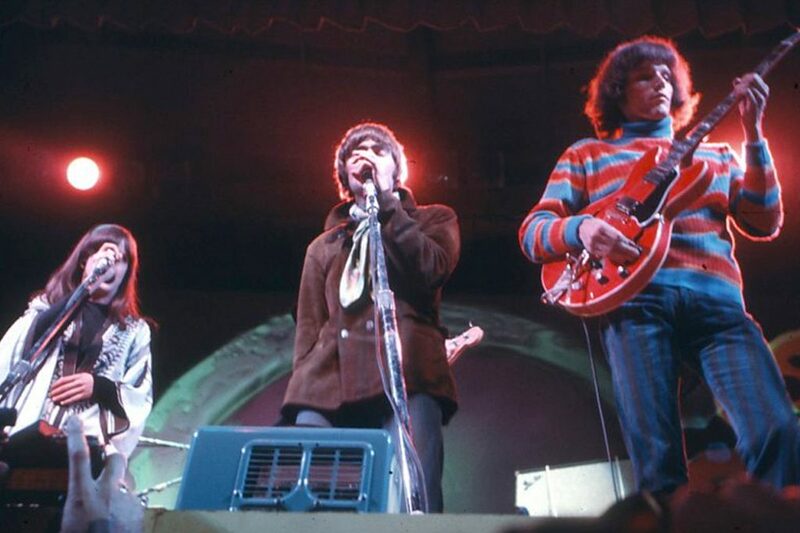 For example, during much of 1967 and ’68, his band had a very close relationship with promoter Bill Graham, who booked the Airplane at the Fillmore and other venues and managed the group, too. Graham had famously escaped the Nazis as a child. Did Kaukonen ever find a moment to speak with him about that? In addition to being a memoir, Been So Long includes diary entries, song lyrics, and a CD of live performances. in ’72 at a show in William and Mary College, I crawled under the stage scaffolding and made my was to a seat on some sorta case back stage finding myself completely alone while airplane performed as I watched through the backdrop. when they came back before the first encoré I couldn’t muster a word to anyone even though I wanted so bad to speak to grace. after the last encoré I kept telling myself to say something! I didn’t know it at the time it was the last encoré but, I managed a “HI” to grace, Paul, John, and papa John. barely a acknowledgement from anyone I almost grabbed jack who stopped to talk, I gave him praises about his playing. I didn’t know I could have told him I played drums and wanted to jam. I just figured they had a drummer, but, in hindsight, I could have possibly been assimilated in to the mix perhaps for the soon to come Starship of the mid to late 70s. wow! I blew it! but, I didnt know it. not till years later. my point? I’d still love to jam drums & percussion with Jack & Jorma. I never stopped playing and would be honored to play with fellow DC-ites where I lived way too long. I’m in Orlando now but have a megshift poorly equipped studio where I write & play mostly for myself I guess just for the love of music. I can play some guitar but never thought of myself as a guitarist even though I have done some solo gigs on guitar. I actually have dedicated fans from the solo shows & with the bands I formed, “Phatto” and “8:59”. my writing is mishmash Ed because I have so many songs and melodies I write that my passion for “not wanting to lose an idea into the void” prevents me from finishing ideas I’ve started much in the same way. my “opposite of writers block” achieved the same results. nothing gets done. so, still wanting to jam, Jorma or Jack give me a call. let’s jam. just like the old days.! Only saw the Airplane once and that was at Woodstock, August 1969 ; they and Jimi hendrix were the reason I went there with my two best friends . It was five days of bliss for us ninteen year olds from the suburbs of Youngstown Ohio! Glad to this day that we went! I am so glad at who you’ve become and I sure hope you remember me! “ ” Hearses were parked outside the theaters and fake nurses in uniform were paid to stand around the lobbies.